As soon as Chiron entered Pisces on April 20, I noticed a trend. Astrology bloggers and their readers were waxing poetic. Posts or comments on Chiron in Pisces contained poems. As a poet, my brain shot into aha! pyrotechnics! Within a week, I gave birth to a new e-book, Poems to Heal the Healer: The 12 Chiron Signs. These dozen poems can read on screen or printed out individually and framed or put on your bulletin board to inspire you. They make great gifts, too. Framing the poem for your Chiron sign it is a nice way to keep your journey to wholeness in mind and in perspective. The other eleven poems make great gifts framed, too—or tools to better understand your partner, boss, kids, or that cranky neighbor. 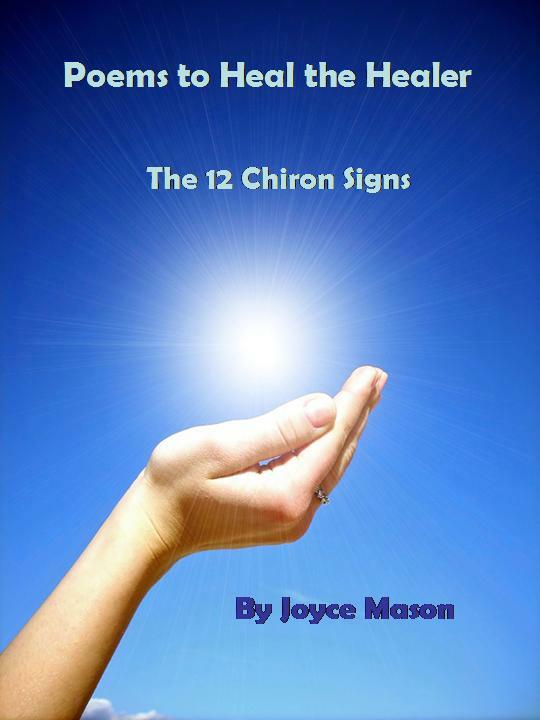 Each page contains a single, beautifully illustrated and poetic capsule of one of the Chiron signs. These are more than poems; each has an energy that poured through me in the creative and artistic process. People can only heal themselves. A healer is someone who sets up an environment or energy that invites and supports the healing process. You can enjoy Poems to Heal the Healer for only $5.95, delivered by e-mail as a PDF file. There are extras! An Introduction about Chiron in Pisces and the arts, an “About Chiron” section, and key words to encourage you to write your own Chiron poem(s) or to explore Chiron through other artistic avenues. See sidebar to order. I am thrilled with this project, which combines my love of poetry and graphics while healing others and myself in the process. It was an honor to “channel” it. I’m still reverberating! May Chiron in Pisces bring you much personal integration over the next nine years—and plenty of poems, music, dance and dreams. About Joyce the Poet: Joyce Mason wrote poems for dozens of literary journals, primarily in the 1970s, and taught in California's Poetry in the Schools program. Two of her poems were recently accepted by Sacramento News & Review to appear on their cultural pages. She plans to publish her first poetry collection in 2010. Awesome! As a poet myself and knowing the healing effects of poetry... this sounds like a great collection. Thanks, Jen! I appreciate your affirmation of poetry as healing. Maybe I'll sponsor a poetry week on my blog and invite you and the other astrologer/poets to contribute. I'm finding out that there are a lot of us! Hope you'll participate. Sounds like a great plan. i would be happy to contribute. Thanks for asking. I am being published in the Hummingbird Review in the Summer edition. Susannah, thanks for the testimonial! Coming from one of my favorite astro-poets, I consider it quite a compliment ... and I hope you're game to contribute to a future Poetry Week or similar event. What a deep and moving poem, Libra Moon. Thank you for sharing it with The Radical Virgo readers!